An evergreen tree, native to the southeastern United States. 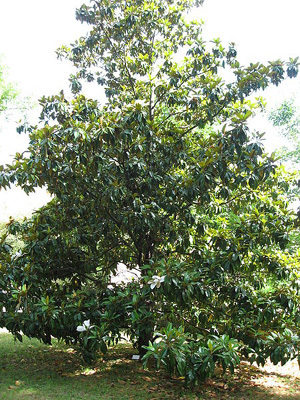 A classic southern tree with large, fragrant, creamy white flowers 8" to 10" in diameter and glossy, dark green leaves 4" to 8" long. It has a dense, conical shape that is nicely symmetrical. It casts dense year round shade. This desirable shade makes it difficult to grow any other plants underneath. Protect from wind in southwest desert. Adequate space is needed for full development into a well balanced tree.